It was an otherwise normal day for Mir, a young mountain girl who lived with her grandfather and Lobo, her dog, until the demons attacked and her life was forever changed. 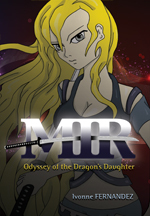 Join Mir as she travels to other worlds in search of answers and truths to her past. Read how she discovers secrets of ancient times, fighting evil forces with new other-worldly friends at her side. Meet the hidden gods she uncovers: some good, some evil. You will be enthralled as you read this fantasy, full of magic, adventure, action, mystery, friendship and love.